This is a single axle – Liquid manure wagon by BRIRI. BRIRI single axle – Slurry spreaders are available in versions with 3000-12000 l as vacuum or pump tanker. Hot-dip galvanized steel container in a stable, hot-dip galvanized and continuous frame members are robust construction with standard equipment. This high quality Liquid manure can be used to distribute the slurry from the slurry pits at the stables or the BGA or from a Feldrandcontainer in the fields. 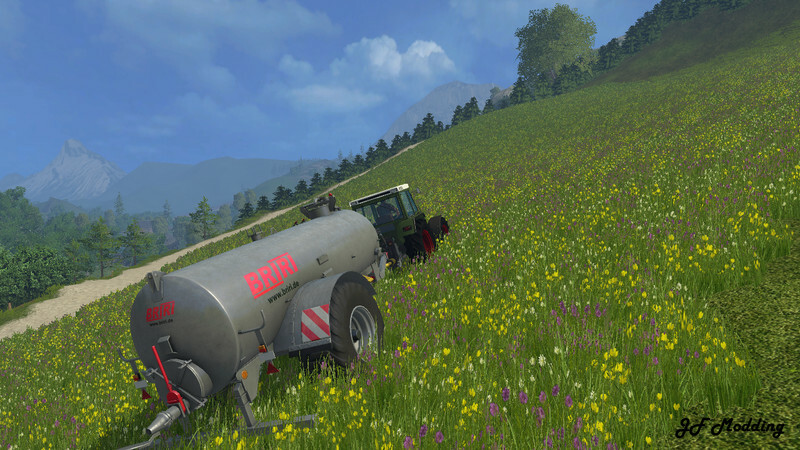 With its 10 meter width, it is sufficient for most players of Farming Simulator. The barrel also has the standard LS15 functions such as light, turn signals and brake lights and a gloss effect and the dirt texture of Giants. JF Modding wishes you fun with this BRIRI!